Has high sensitivity, permittivity, and time stability in applications when used as the receiver or generator element in accelerometers, vibration pickups, and hydrophones. Is suitable for both constant and repetitive conditions in sonar, ultrasonic cleaning, and other high power applications. 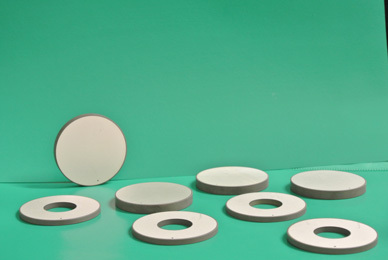 This material produces large mechanical drive amplitudes while maintaining low mechanical and dielectric losses. Applications nanopositioning, medical apps and multilayer Actuators. Is used in high power applications and has an extremely high mechanical quality. With the ability to withstand high levels of electrical excitation and mechanical stress, Navy Type III has the best power handling capabilities. Applications include ultrasonic cleaners, cell disruption, high power ultrasonics and ultrasonic welding. Has very high permittivity, coupling, and piezoelectric constant, but lower time stability. It is used in applications requiring fine movement control or for sensitive receivers. Its low Curie temperature restricts its operating temperature range. Applications include medical diagnostics, industrial NDT and nanopositioning. 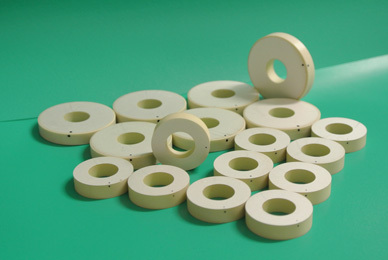 Company has experts with longterm experience of production piezoceramic powders and all type of transducers in large quantities. On the base of wide and deep experience in the field of piezo industry as well as its ability of cooperation with universities on research focuses company decided to open new PZT division.